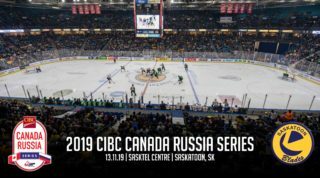 It could have been the biggest comeback in recent memory for the Saskatoon Blades but unfortunately it was spoiled with just over a minute remaining in overtime as the Moose Jaw Warriors edged out the Blades 7-6 on Tuesday night. The much needed single point gives the Blades an 8-12-2-0 record on the season. The game started heavily in favour of the league leading Warriors, opening the scoring 4:29 into the game off a rebound from Jaxan Kaluski. Then a pair of power play goals from Jayden Halbgewachs– his 21st and 22nd of the season– gave the Warriors a 3-0 lead and a 15-5 advantage on the shot clock after 20 minutes of action. Saskatoon came out looking refreshed in the second period and matched Moose Jaw’s efforts. The Blades scored twice, both coming from Cameron Hebig, but the three goal deficit remained as the Warriors also netted two more goals to make it 5-2 after 40 minutes. It wasn’t a great night for the Blades special teams who allowed 3 power play goals and a short handed marker within the first 2 periods. With the game looking out of reach and already putting in a evenings worth of work, Nolan Maier was on the bench to start the 3rd period. Joel Grzybowski came in to start the final frame after Maier made 29 saves on 34 shots. Moose Jaw added to their lead 2:55 into Gryzbowski’s tenure to make it 6-2 for Saskatoon. This is when something changed for the Blades. For whatever reason, instead of folding up the tent and going through the motions until the final buzzer, a fire erupted in the visiting squad. Brad Goethals responded for Saskatoon just 16 seconds later to make it 6-3. This was Goethals first goal in 14 games, and it was only the beginning of the comeback for the Blades. With 13 minutes remaining and the Blades on the man advantage, Braylon Shmyr fed Cameron Hebig in the slot for a perfect one-timer to make it 6-4. The goal was Hebig’s 3rd of the night, 18th of the year, and his second hat-trick of the season. Two minutes later, Josh Paterson banked a pass off a Warrior defender to score his 7th of the season to put the Blades within one. Suddenly, the crowd wasn’t as cheery as they were earlier in the period and the Moose Jaw bench looked bewildered. 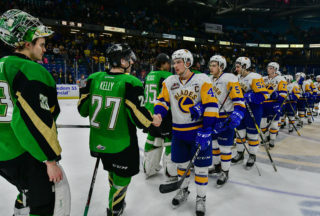 The Blades had stolen 100% of the momentum from the top team in the Western Hockey League. But then Michael Farren took a hooking penalty at the 9:01 mark of the period, which looked like the comeback could be halted given the Warriors deadly power play unit that was already 3/4 on the night. However, Saskatoon killed it off and got back to even strength still riding the lions share of the momentum. With 6:21 remaining in the game and still down by one, the puck bounced off the boards and out near the Moose Jaw blue line where Caleb Fantillo spun and fired a slap shot over the glove of Brody Willms to stun the crowd, and the Warriors, tying the game at 6-6. Moose Jaw pushed back trying to avoid the unthinkable, but Joel Grzybowski kept the game tied to force overtime. In the extra period, the Blades controlled the puck for the first half but couldn’t muster any quality chances. Eventually, the Warriors were able to stretch out the Blades to create some open ice and Brayden Burke ripped a wrist shot glove side on Grzybowski to spoil the storybook effort by Saskatoon and win the game for Moose Jaw with just 1:03 left on the clock. The game wraps up three meetings in 7 days between the Blades and Warriors with Saskatoon going 1-1-1-0. Statistically for the Blades, Cam Hebig lead the way with his 2nd hat-trick of the season. Caleb Fantillo (1G,1A), Braylon Shmyr (2A), and Libor Hájek (2A) all had multi-point games. 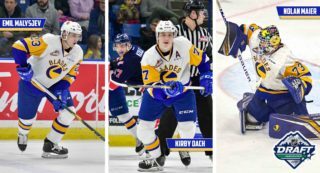 Josh Paterson scored his 2nd goal in as many games, and Kirby Dach chipped in with an assist; his 3rd point in 4 games since returning from the World U17 challenge. Rookie d-man Randen Schmidt registered his first career WHL point with an assist on Hebig’s 2nd goal while finishing the night with a +1 rating. 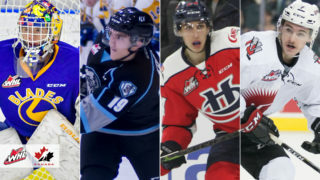 Nolan Maier posted his best save percentage of his three career WHL starts with an .853, while Joel Grzybowski stopped 10/12 shots faced to allow the Blades to force overtime and ultimately get the point in the standings. 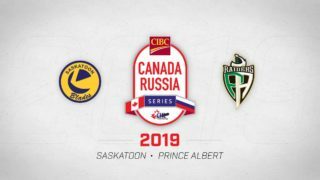 Next up for the Blades is another division rival Wednesday night; the most familiar foe for Saskatoon as they visit the Swift Current Broncos for game #5 of the season series. Game time is 7:00pm in Swift Current and fans can tune in live on 92.9 The Bull FM or streaming at WHL Live. The next Blades home game is Friday, November 24th at SaskTel Centre versus the Brandon Wheat Kings. Click here for tickets or call 306.975.8844 to book your group night or experience package!